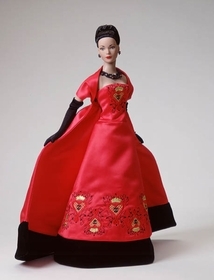 Regal strapless, red satin gown with attached shrug and train. The gown features a wide band of lush black velvet around the hem and rich gold, black and red embroidery. She's accessorized with black opera length gloves; matching jet beaded earrings and necklace; sheer pantyhose and black heels embellished with jeweled and gold-tone ornaments. Never displayed.